Saga #36 was first released on 4/27/2016. By Zack Quaintance — There was some big news this week about Saga! Not the big news about when the book is finally coming back, but decent-sized news all the same. My Twitter buddy Christian Holub had the scoop over at Entertainment Weekly, the scoop being that this hiatus is taking place at Saga’s halfway point, and the full story will run for 108 issues. Wild. I breathed a pretty big sigh of relief when I read this, mostly because when the hiatus was first announced, Saga writer Brian K. Vaughan seemed ambivalent about coming back to the story at all. Soon after, Vaughan announced he was ending his other current ongoing comic, Paper Girls, and visions started playing in my head of one of my favorite writers walking away from comics all together to go off and focus on TV. But no need to worry! In fact, this piece also notes the next Saga hardcover is due in October, which has me wondering if the book itself might come back soon after...hmmm. But that’s news for another day. Let’s take a look at this week’s re-read issue! Oh, well done! It’s one word and four items of punctuation, but it gets across so much without actually revealing anything at all. Could this be it? Could the Saga preview text writer have achieved utter perfection at their job? Yes, I dare say, yes. Tip of the hat. Onward! The Cover: I like this cover well enough. It’s a little rough by the fully-rendered standards of many covers in this series, but I like the variety it brings to the set. When you take all these covers together, this one probably breaks things up a little bit. It also weirdly continues to develop the character of The Will, who I totally get even if I don’t agree with him whatsoever at all, which I suppose is the mark of a solid antagonist. The First Page: After an issue entirely absent of Hazel’s narration, we get a first page loaded with it. Four panels and a whole bunch of (well done) writing about violence against young children in school. This was (and sadly still is) a part of the fabric of the news cycle in 2016, and it’s easy to see why Vaughan would be drawn to it as a parent of school-aged children. This bit is blatant with its commentary, to be sure, but well-written and powerful within and outside of this context. The Summary: We open with Marko teleporting into the prison school, where he finds Noree and Petrichor in the middle of executing their own escape plan for Hazel. That latter plan is complicated by things happening elsewhere (Phang...but more on that next arc) that lead to heightened security here. Elsewhere, The Will does battle with Ghus...who lops off his freaking fingers. I’d forgotten all about that. Back on the prison planet, there’s a bit of fighting, but more importantly when it’s done, we get a reunion between Hazel and Marko—and I’m instantly a big sappy mess about it. Then we bounce back to The Will, who is trying to murder little Ghus and Prince Robot IV’s son Squire, egged on as he is by the ghost of his dead lover The Stalk, before being ultimately deterred by the ghost of his dead sister, who is less of a devil on his shoulder and more of conscience. The ghosts end up encouraging him to go back to Gwendolyn (I think). While all this is going on, Upsher and Doff escape from where he was holding them captive on his ship. Back in the prison, our emotional reunion between father and daughter quickly turns into an emotional goodbye between mother and son, as Marko’s mom decides to stay in the prison, where she will make a difference to the inmates and not be a burden as she might with Marko and Alana. Petrichor is more than happy to take her place as part of the escape. Petrichor then ruins (sort of) Alana’s reunion with Hazel by teleporting onto the ship, assuming Alana is the enemy, and belting her in the face. We end on Petrichor using her heightened sense of smell to correctly sense that Alana is pregnant. I’ve groused a bit about this arc, but I must say now that I too suddenly got it all over again when Marko was reunited with Hazel. Sigh. The Subtext: The first part of the issue is heavy on subtext about violence in schools, which can only be read as an allusion to our ongoing nightmarish rash of national school shootings. I unpacked that earlier, so I’ll instead use this section to note there is another current of subtext about avoiding danger by living in peaceful moments with ones you love, making the choice to say on the marooned planet or in the jail, rather than continuing to strive for the spotlight and action. 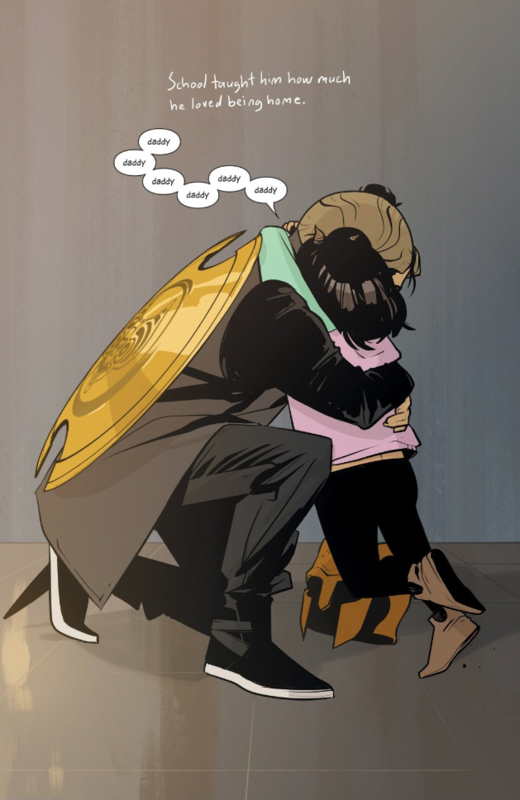 This, of course, is complicated for characters like Marko and Alana who are being pursued, but in this issue we see several characters take a peaceful way out—The Will, Upsher and Doff, Marko’s mother—even if for most of them that peace is only temporary. The Art: I just want to use this space to direct your attention to the first selection here, and note that if this were Wic + Div, we’d be well on our way to the spin-off one-shot, The Buried Treasure of the House of Ghus. I’ve included more Ghus artwork in this week’s gallery to emphasize how adorable this might be (as if anyone who has read the series doesn’t already know). 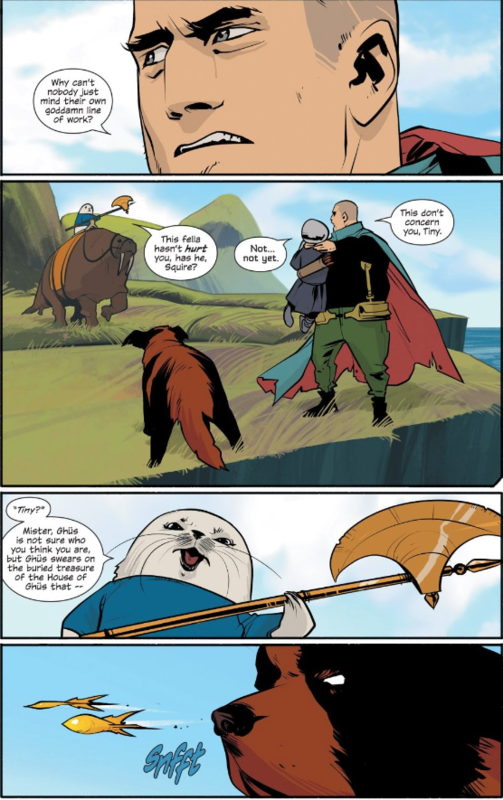 The Foreshadowing: Hazel’s narration at one point says something about the worst being an option to happen anywhere at anytime, which is maybe a bit of an illusion to something that comes later (see Saga #54, if you’re doing a re-read). Join us next week as we dive into Saga #37, which starts this book’s very cool self-contained THE WAR FOR PHANG event!